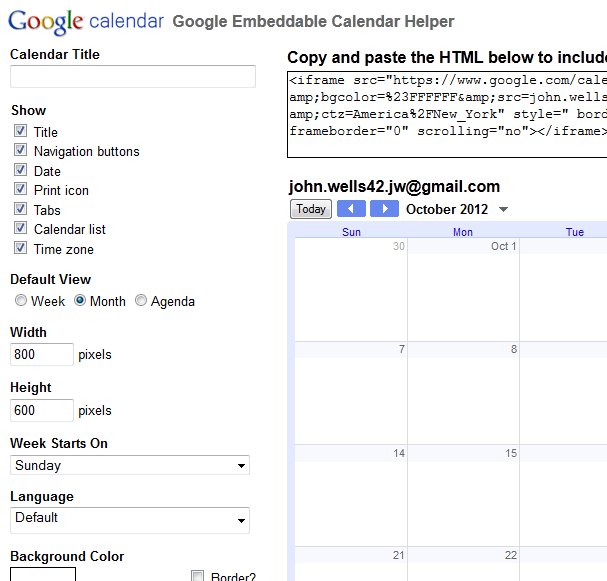 Google Calendar provides great integration on your WordPress website. You can sign up at http://calendar.google.com. After you get your calendar set up and ready, click the cog wheel in the upper right and go to Settings. Click the Calendars tab at the top (next to General). Click Share this calendar next to the calendar you want to use and make it a public calendar, then hit Save. Go back to the Settings > Calendars tab, and click on the name of the calendar you want to embed. You get a screen like the one below. Experiment with the different views (Week/Month/Agenda) and which menu items you want to turn off (like Title , Nav buttons, the Print icon, etc.). You will probably need to experiment with the size as well depending upon where on your site you want the calendar viewed. Inside a Page/Post it will probably need to be around 400 pixels wide. You will see a preview of what your changes look like to the right. When you have it like you want it click the “Update HTML” button on the top right, then open the page/post/widget in the editor where you are inserting the calendar. If it is a page or a post click the Text tab at the top right of the Page/Post in the editor, scroll down to where you want the calendar to appear and paste the code there (Ctrl + V).